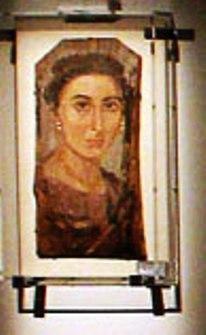 The Fayum Mummy Portraits continue to surprise to this day with their modern sensibility and vitality. Made between the first and fourth centuries A.D. they come from the tomb of Al- Fayum as well as from other places across Egypt, and they are borne of a mixture of Greek encaustic painting, Roman realism, and Egyptian funerary rituals. The exhibition Fayum Portraits + Adrian Paci: No Visible Future, organized by the Ministry of Culture, National Archeology Museum and PHotoEspaña posits these paintings as the earliest antecedent of photography since, in a manner similar to ID photos, the painters portray with the greatest possible exactitude the characteristics of their subjects so that the souls of the dead could recognize them – hence the portraits’ simplicity and accuracy. John Berger dedicated one of his most elegant texts to these works; in it, he relates them to the migrations of our time. 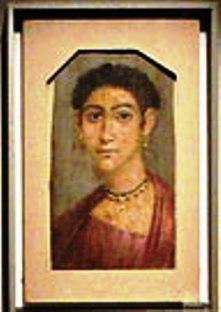 This exhibition seeks to pay them homage, bringing together 13 portraits that are shown along with the video Centro para la permanencia temporal (Center for Temporal Permanence), by Adrian Paci, a work in which time stops, and its protagonists – possible emigrants seek to depart but do not move – are subtly fashioned like the living-dead of Fayum. 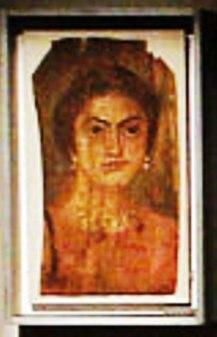 The exhibition features works that, due to their concept and function, rather than their technique, They were painted by Greek artists on wooden panels and canvases that covered the face, as part of the mummy’s wrappings. These are the oldest two-dimensional portraits in existence, and the only example of Classical easel painting to have come down to us. These paintings for death, which were made to be buried rather than put on display, seem so incredibly alive, just like a good photographic portrait, which captures both the subject and the moment. Adrian Paci (Albania, 1969) studied at the Academy of Arts in Tirana. He has shown individually at the Kunsthaus in Zurich, the Istanbul Museum of Modern Art, the Kunstverein Hannover, and P.S. 1 Contemporary Art Center in New York. His work has also been part of collections shown at the Centre Georges Pompidou in Paris, the Fundació Caica in Barcelona, the Moderna Museet in Stockholm, the Miami Museum of Contemporary Art, and the MoMa in New York. Paci represented his country in the first pavilion of Albania at the Venice Biennial.